← Engine bay - nearly finished! Smelling fuel is never a good thing. We were getting the car ready to go down for its MOT, running through all the usual checks, when we realised the fuel pump was still ticking. A quick look around the carbs and we saw fuel dripping from underneath. A couple of minutes later and we found the leak, well not a leak rather an overflow. Fuel was pouring out of the rear carb's overflow pipe. That was either a part of the carb was stuck, maybe a float had cracked as we could see the piston was fine, or something had got lodged inside it. Our first guess was that it might be a small piece of fuel pipe which had made its way into the carb as we had replaced an old one a few weeks earlier. In the hope of still getting to the MOT we tried clearing any possible debris without pulling the carb apart. We did this by first disconnecting the fuel pump and then running the car until it stopped in order to drain the system. We hoped that once the pump was reconnected, the sudden flow of fuel would be enough to wash out the debris or break free the float. We did this twice, each time it seemed to work, but after a few minutes fuel began leaking again. The only option now was a carb strip-down. Unfortunately it meant the MOT had to be postponed while we took care of it. We took apart the rear carb, examining the float for any cracks which might have let it fill with fuel. When no cracks were found we gave it a thorough clean with some carb cleaner and reassembled it. After starting, stopping and running the car for a while once everything was back in place without any further leaks we decided that we'd finally cleared the problem. All this did throw up an issue with the overflow pipes. 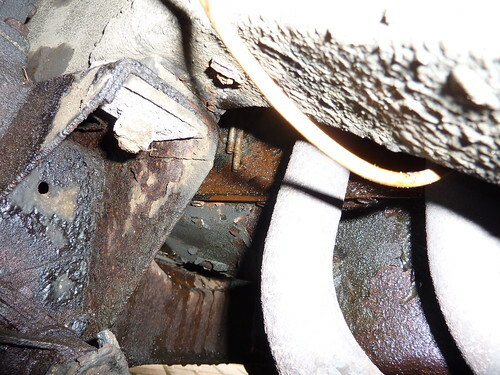 As you can just see from the photo the two pipes terminate just above the flange on the sump, just ahead of the hot exhaust manifold. This has two consequences. First, the flange acts as a small reservoir, allowing the fuel to pool a little before falling off. This means that you might not become aware of the issue until an amount of fuel has already leaked, which brings us nicely to the second issue. Fuel and hot exhausts do not mix well. I'm going to be extending these overflow pipes down as far as I can towards the ground, both to give me earlier warning of any leak and to hopefully avoid any fuel hitting the exhaust.